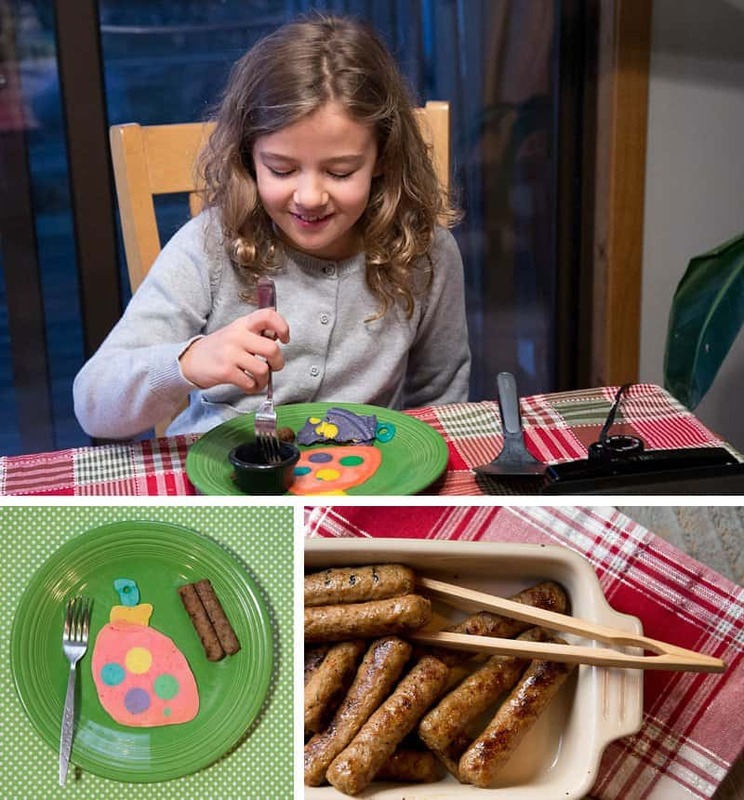 Simple Holiday Traditions: Christmas Pancake Art With The Kids! This post on *slow* and simple holiday traditions is sponsored by Johnsonville Sausage. December is upon us, and I’ve already found myself getting lost in the hustle and bustle of the season. Last night, I sat down at our family calendar and penciled in the simple things I didn’t want to miss amid all the holiday chaos. I added dates for things like: making giant snowflakes, baking festive treats and cookies, and snuggling up to our favorite holiday movies. Sometimes the simple holiday traditions are the best, most memorable ones. The common denominator in all of the activities I added to our calendar? They all require that I give my girls my full attention. Now grab a piece of paper and a pen. Jot down a list of activities that make the holiday season special for you and your family. Then go back and assign dates to those activities on your calendar to ensure your ideas don’t get lost with your family’s busy schedule and obligations. Let’s all just slow down and be together. One of my family’s favorite slooooow and simple holiday traditions is to have breakfast for dinner with Holiday Pancake Art. We have so much fun with this activity each year. Honestly, you’ve gotta try this playful tradition—even if you just try it once to say you did it. It’s truly a bonding experience filled with joy and giggles (and a few splatters, too). 1. Schedule a nice chunk of time and set the scene. Get some peppy holiday tunes playing in the background. Music helps everyone get into the spirit. Pull out the festive table decorations, or consider using your good china to make the night a real STANDOUT. 2. Find your perfect pancake art recipe. When we do pancake art, we always use this pancake recipe for the batter. It is nice and thin, it tastes great, and it’s easy for my girls to work with. I should mention, though, it bakes into more of a crepe-style treat than a big ol’ puffy pancake! 3. Get the sausages sizzling. At our house, Breakfast for Dinner isn’t complete without the smell of sausage in the air. We usually brown-up some fresh Johnsonville breakfast sausage links to make the meal complete. 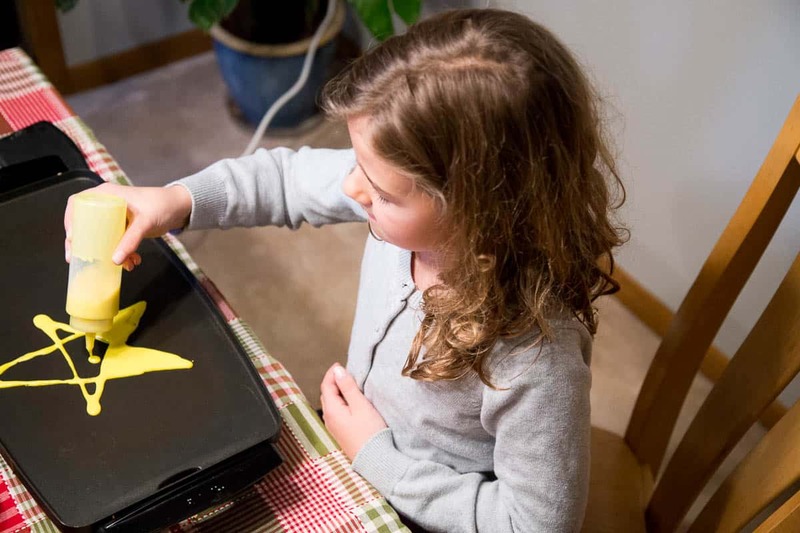 However, when doing your special sloooow pancake art dinner with the kiddos, you want to make sure you’re giving them your full attention. So, in this scenario, feel free to switch to Johnsonville’s fully cooked breakfast sausage to keep things simple and quick. It’s got the same great flavor but with zero fuss. You can even microwave the sausage links if you prefer—30 seconds to Y-U-M.
4. Get your squeeze bottles ready. 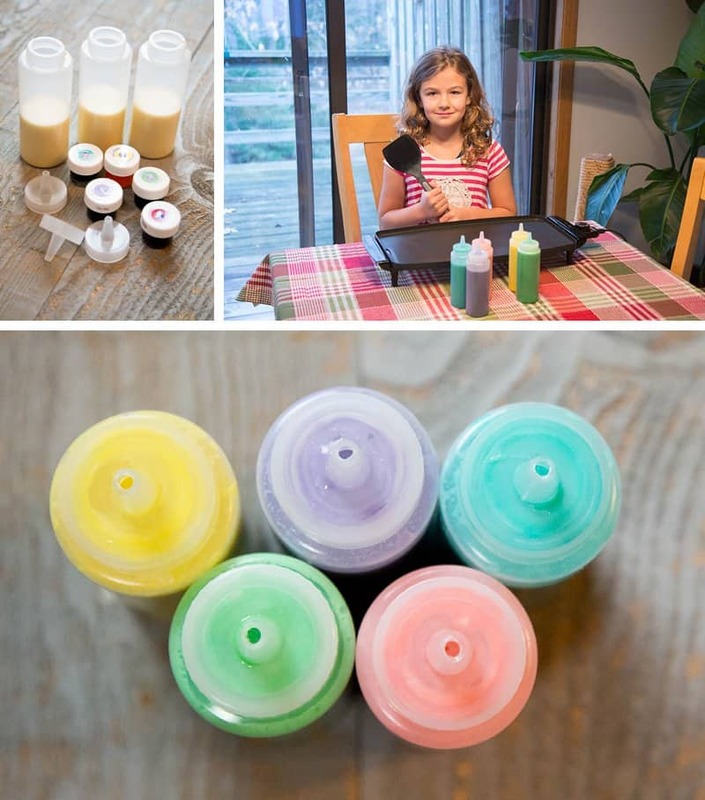 Plastic squeeze bottles make pancake art easy-peasy. You can order bottles online or find them in either the kitchen section or the cake-decorating section of your local store. I pour batter into the squeeze bottles with a liquid measuring cup, add some food coloring, and shake (with the lid on and a finger covering the opening at the tip) until fully mixed. If you’re not keen on using food coloring, consider using delicious things like pureed raspberries, strawberries, or blueberries to color your batter. 5. Start simple. Begin by making a “Snowball Pancake.” Yep. Make a plain-ol’ boring circle pancake, call it a “Snowball Pancake,” and your kids will be ecstatic already. “Who wants the first Snowball Pancake?” Hands will fly in the air. Trust me. To get started, set your griddle to 375 degrees or your stovetop burner to medium-high, to allow you and the kiddos a little time while you’re cooking to work your magic. This temp allows the batter to set properly, but still gives you some leeway to play around. Relax, my friend. This doesn’t have to be Pinterest-worthy; it simply should bring a smile to your child’s face. And ya know what? If you’re smiling while you’re doing this, they’ll be smiling, too. Mmmmm. Yep, yep. That’s a sausage tree trunk on our Christmas Tree Pancake. Love the 3D effect it creates. DESIGN TIP: Outlines first! When you’re creating your pancake art, you always want to create an outline and then fill the space. In the tree and ornament tutorials showcased in this post, you’ll notice the polka dots were added inside an outline of the larger shape, allowed to cook briefly, and then the remaining space was filled in with batter later. This stops the colors from bleeding together and keeps your design intact. I’d like to say it’s because of all the family bonding going on, but more likely it’s because she LOVES breakfast sausages dipped in fresh maple syrup. Who doesn’t love Breakfast for Dinner? 7. Get the whole family involved. Sometimes adults can be the most hesitant to participate in this whimsical holiday tradition. Remind reticent dads, grandmas, etc., that it’s a great way to teach your kids the joy of making (delicious) mistakes. If you goof, just gobble up the botched design and try again. Messing up never tasted so good. Whenever we start our Pancake Art Dinners, my husband always holds back, leaving the actual cooking to me and the girls. After a while, though, he always ends up being inspired by our laughter and joins in. Ironically, his designs often end up being the most creative. 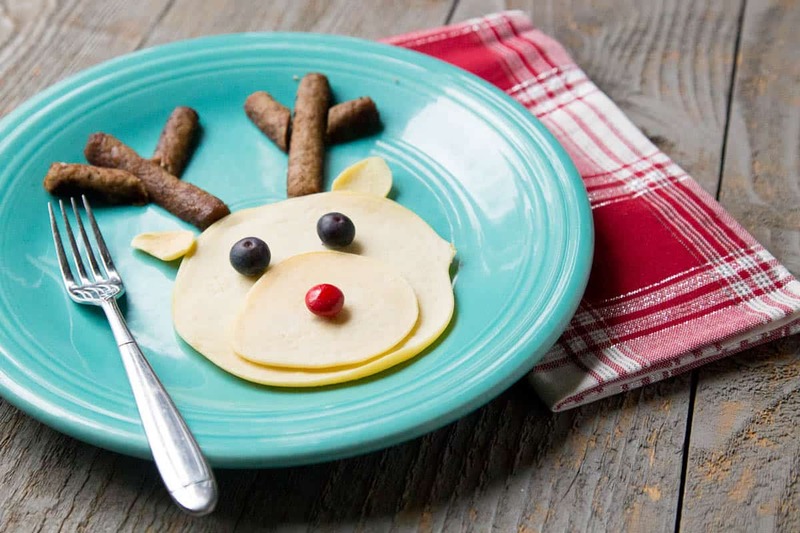 How cute is this little red-nosed reindeer with sausage antlers that he made this year? It’s super simple, too. Voilà! Reindeer Pancake Art. So, what do you think? Easy, right? Consider trying some simple and slow holiday traditions with your family this year. Or create a new *slow* tradition of your very own. 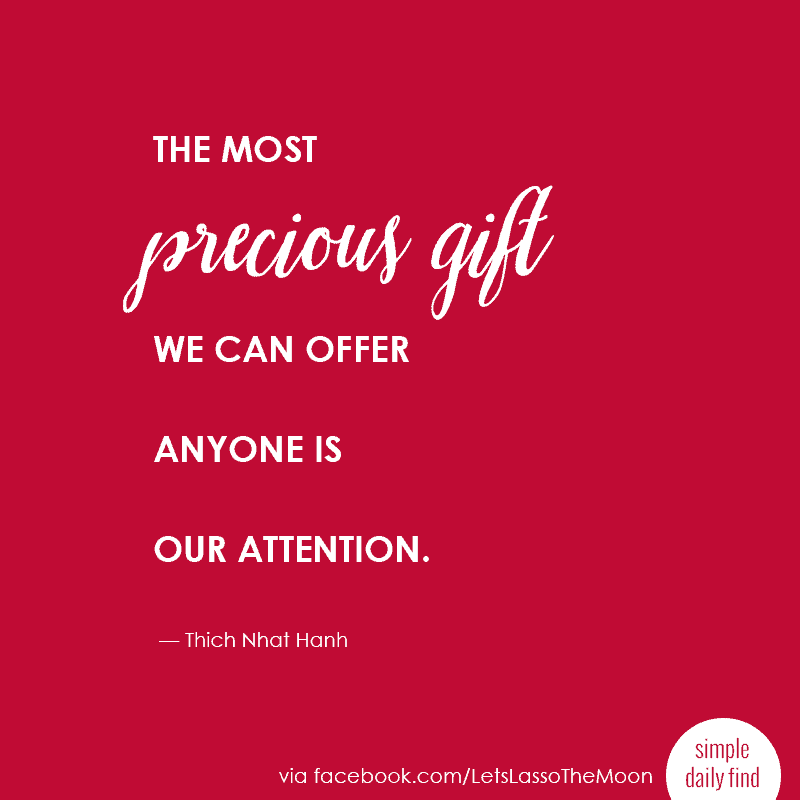 It’s not important what you do, just that you do it together and with one another’s full attention… for that’s the best HOLIDAY GIFT of them all. P.S. If you do decide to add Pancake Art to your family’s simple holiday traditions To-Do list, be sure to pop over and check out even more Holiday Pancake Art ideas here. Follow my Sunday Dinner Recipes and Creative Family Kitchen Pinterest boards for ongoing kitchen inspiration. 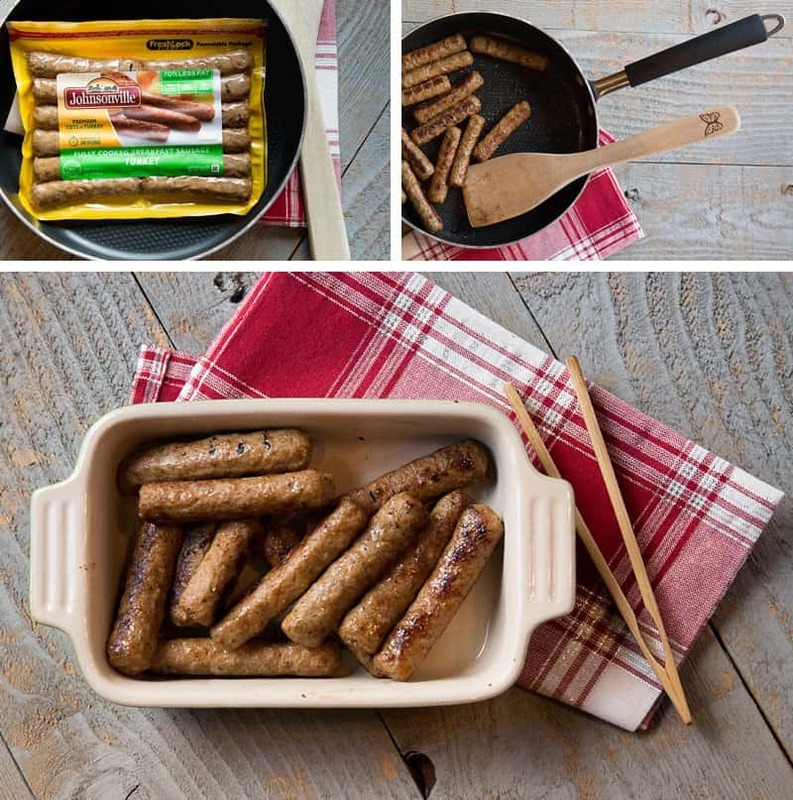 And be sure to check out Johnsonville on Pinterest for a great collection of family-friendly recipes, too. Disclosure of Material Connection:This is simple holiday traditions piece is a “sponsored post.” The company who sponsored it compensated me via a cash payment, gift, or something else of value to write it. Regardless, I only recommend products or services I use personally and believe will add value to my readers. I am disclosing this in accordance with the Federal Trade Commission’s 16 CFR, Part 255: “Guides Concerning the Use of Endorsements and Testimonials in Advertising.” This is a sponsored conversation written by me on behalf of Johnsonville. The opinions and text are all mine. 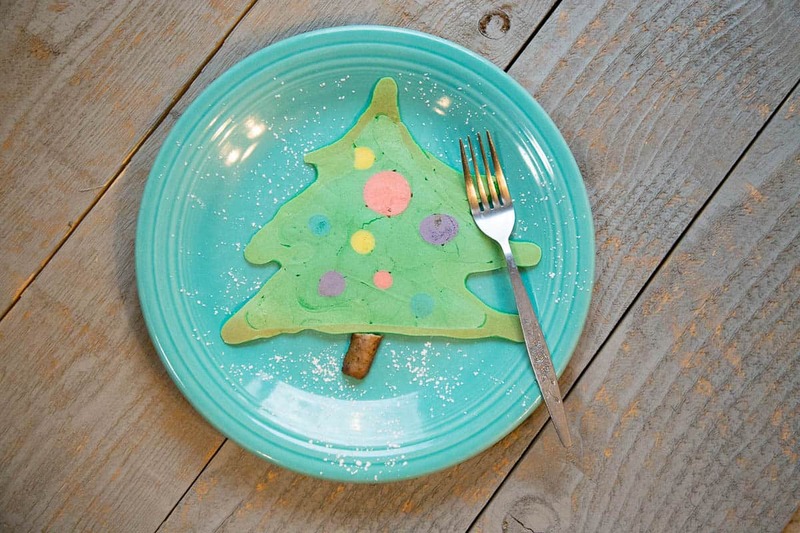 « Christmas Pancake Art: 5 Easy Holiday Designs *Anyone* Can ROCK — Including Kids!